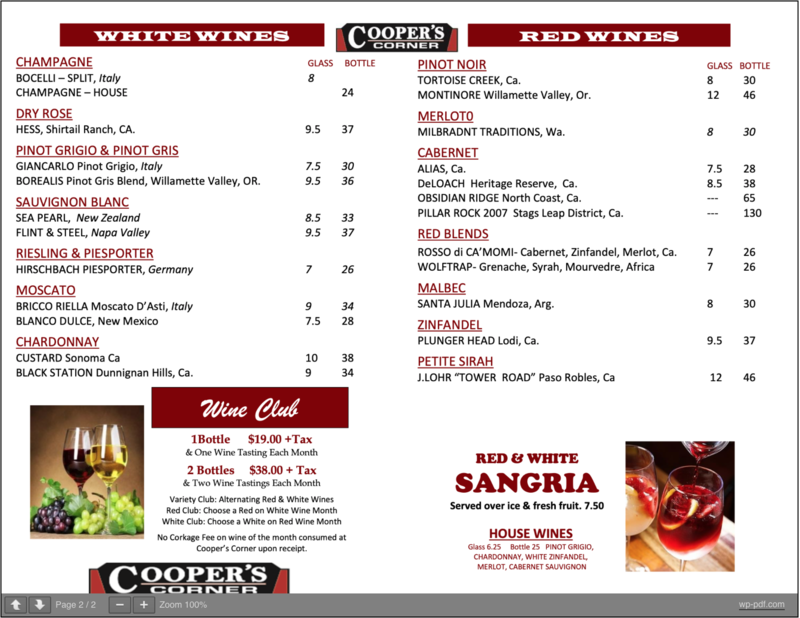 Group Order Wine Menu Sign Up For Deals! U.S.D.A. certified angus beef. Hand trimmed and fire-grilled the way you like it. Best ribs in town. No bones about it. Tender, fall-off-the-bone ribs. U.S.D.A. certified angus beef burger. To bring you a great tasting and flavorful burger! 12" fresh Italian thin crust! Add regular toppings for $0.50, specialty toppings for $1.00, or premium toppings for $1.50. We serve a variety of American cuisine here at Cooper's Corner including prime steaks, baby back ribs, and burgers. Don't forget to try our Seafood Pasta and New Orleans Salmon! Find us on Roosevelt Avenue east of Cantigny Visitor Center and Robert R. McCormick House. Order online for carryout or delivery!